I’ve owned many dogs in my life, but one of my favorites was a chow chow named Chewie. She and I were attached at the hip. We traveled everywhere together—including my office, where she never failed to bring smiles to my patients’ and staff’s faces, or to raise my spirit during long days. Chewie was 14 when we had to say goodbye. I still miss her dearly, and she’s been an ongoing inspiration to me in my work to find the best ways to prevent and manage dog joint pain. Is Your Dog Experiencing Joint Pain? Joint pain tends to be a common problem in dogs as they grow older—especially for larger breeds like Chewie. Unfortunately, though, our companions can’t come to us and say, “My hip hurts.” That’s why it’s so important that you always be on the lookout for signs of stress. Your dog has trouble climbing stairs. He or she needs extra time to move from lying down to sitting up or standing. She is less eager to go on walks or to play. He can’t jump as high or as far as he used to. If you’ve noticed changes like these, it’s probably a safe bet that getting around isn’t as easy for your dog as it used to be—and you need to take steps to ease his or her pain. But even if your dog doesn’t show signs of joint issues, you can still act preventatively and, ideally, stop discomfort before it starts. I’m a big fan of glucosamine and chondroitin for supporting healthy joint mobility. The body—human or animal—uses both to build strong cartilage and synovial fluid in joints. That’s good for flexibility because cartilage and synovial fluid help cushion and lubricate joints, so they can bend, rotate, and absorb the impact of running, jumping, and walking. If you decide to go this route, though, you must make sure that the glucosamine and chondroitin supplements you give your dog are specifically designed for dogs, and not for people. Dogs need a different amount of these nutrients than we do, so sharing from your own supplement cabinet is not the best idea. This ought to be a no-brainer, but too often we’re just as neglectful of our dog’s weight as we are of our own. And while you may not even notice a couple extra pounds, they can really take a toll on your pup’s joints. The best way to get your dog’s weight down is through a combination of exercise (more on that in a minute) and making sure you’re feeding him the right foods, in the right amounts. High-quality store-bought foods are one good option. Homemade diets can be helpful, too, but you have to be really careful with those to ensure that they cover all of your dog’s nutritional needs. Too many grains, for example, can have the same effect on your dog’s blood sugar as they do on yours—and you know where those extra calories go…straight to your fat stores! One of the ways I tried to ease Chewie’s pain was by feeding her cans of wild Alaskan salmon. Why? Salmon is loaded with omega-3 essential fatty acids. In people, omega-3s have been shown to reduce some joint stiffness and tenderness, and to support joint lubrication. You can feed salmon or another cold-water fish, like halibut, mackerel, sardines, tuna, or trout. They’re well known for omega-3 content. Or, you can put a tablespoon of fish oil over your dog’s food. For the best outcome, though, I’d go with omega-3s from green-lipped mussels. 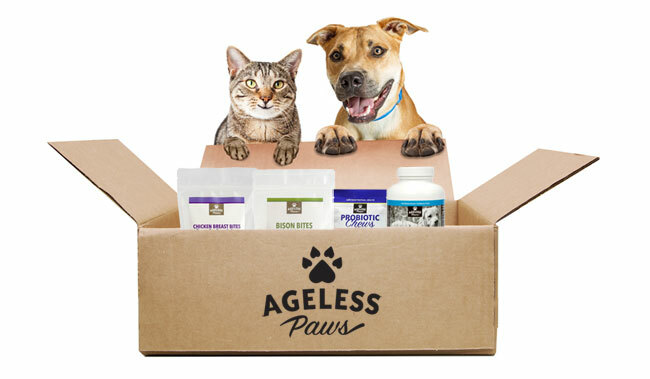 I learned about them while working with veterinarians to select my own dog joint health supplement, and I was blown away. In addition to omega-3s, the green-lipped mussel contains chondroitin (which I mentioned earlier), antioxidants, vitamins, minerals, and enzymes. That’s a win for your dog’s joints, and also for his overall health! One of the worst things you can do for your dog’s joint pain is to indulge his desire to just sit still. Low-impact exercise keeps joints moving, which helps restore and preserve both flexibility and strength, increase range of motion, improve blood flow to the tissue surrounding joints, and encourage a healthy weight. The only problem is that once joint pain sets in, your dog probably isn’t going to be especially excited at the sight of a leash. One way to address this is by changing up the type of exercise. If your dog likes swimming, the natural buoyancy of water makes it a safe, ideal environment for working out achy joints and muscles. Or you can try dog massage to warm up and loosen stiff muscles and joints. (You love a good massage, and so does your dog!) Modern Dog magazine has a great summary of how to get started here, or you can look for a professional provider in your area. All this, of course, doesn’t mean you should skip your daily walk. Joint health is a “use it or lose it” proposition, so it’s essential that you get out—whether it’s around the neighborhood, the park, or even just the yard. Just stay mindful of your dog’s limitations. Start out slowly with 10 minutes once a day, until your dog works out the kinks. From there, you’ll want to work up to 20 minutes or so once or twice a day, if you can. There are two reasons that I recommend you play with your dog on grass, sand, or soil. One is that these natural surfaces are softer and more forgiving than asphalt or concrete, which means your dog’s joints won’t have to absorb as much impact as they would on harder ones. The other is that whenever your dog spends time on a natural surface, she’s absorbing the healing energy of the Earth. I’ve been promoting Earthing, or grounding, for a decade now, and am a huge proponent of its power to rebalance the body by reducing stress and neutralizing free radicals—both of which can reduce the effects that joint pain has on your dog. Fortunately, Earthing comes naturally to dogs. I’m not sure I’ve ever met a dog that didn’t like sniffing around in the yard or rolling in the dirt! Remember, even though joint pain tends to be a common problem in aging dogs (and especially in larger breeds), there are plenty of ways you can help your best friend stay happy and active. All it takes is a little bit of time and commitment on your part to help make your dog’s later years some of his/her best years. AVMA. “Raw or Undercooked Animal Source Protein in Cat and Dog Diets.” Accessed July 13, 2017 at https://www.avma.org/KB/Policies/Pages/Raw-or-Undercooked-Animal-Source-Protein-in-Cat-and-Dog-Diets.aspx. Bhathal A, e tal. Glucosamine and chondroitin use in canines for osteoarthritis: A review. Open Vet J. 2017;7(1):36–49. Bierer TL and Bui LM. Improvement of Arthritic Signs in Dogs fed Green Lipped Mussel (Perna canaliculus). Nutr. June 1, 2002;132(6):1634S–1636S. Gupta RC, et al. Comparative therapeutic efficacy and safety of type-II collagen (uc-II), glucosamine and chondroitin in arthritic dogs: pain evaluation by ground force plate. Journal of Animal Physiology and Animal Nutrition. 2012; 96:770–777. Johnston SA. Osteoarthritis. Joint anatomy, physiology, and pathobiology. Vet Clin North Am Small Anim Pract. 1997 Jul;27(4):699–723. McCarthy G, et al. Randomised double-blind, positive-controlled trial to assess the efficacy of glucosamine/chondroitin sulfate for the treatment of dogs with osteoarthritis. Vet J. 2007;174(1):54–61. McNamara PS, Johnston SA, and Todhunter RJ. 1997. Slow-acting, disease modifying osteoarthritis agents. Vet Clin North Am Small Anim Pract. 27:863–881. Rialland P, et al. Effect of a diet enriched with green-lipped mussel on pain behavior and functioning in dogs with clinical osteoarthritis. Canadian Journal of Veterinary Research. 2013;77(1):66–74.